Peacefully on the 4th of April. Dearly loved Husband of Michelle (dec). 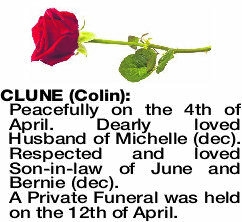 Respected and loved Son-in-law of June and Bernie (dec). A Private Funeral was held on the 12th of April. 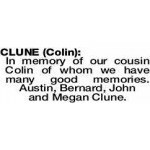 In memory of our cousin Colin of whom we have many good memories. Austin, Bernard, John and Megan Clune. 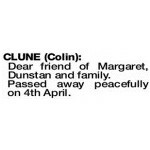 Dear friend of Margaret, Dunstan and family. Passed away peacefully on 4th April.